The 4th is one of my favorite holidays (behind Halloween, of course), and I have loved celebrating it here in Watercolor for the past 5 years. Each 4th of July, we head to my fiance's family friends' condo, enjoy fireworks from their balcony and indulge in what has become an unexpected 4th of July food tradition: crawfish etouffee, she crab soup, and a chocolate fountain. While it might not seem very "traditional", it wouldn't be the same without it for this family. I recently stumbled upon Party Skirts and couldn't wait to make a post of out them. I definitely think this is on my holiday party radar already. I love the shape and the traditional cut. Very Mad Men, no? Add a nautical Judith March tank, a pair of killer shoes and poppy accessories and head to the fireworks! 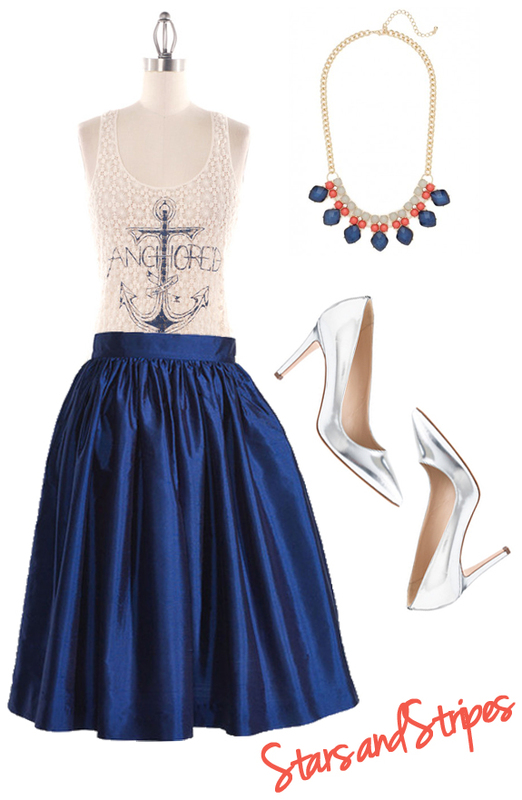 That skirt is SO fun, love a more glam look for the 4th! Hope you had a great time celebrating!! Oh my goodness, that skirt is fabulous! Hope you had a great day love! Oh my word! That shirt is too dang cute! I love nautical themed pieces. I wish I was a rich chick and owned my own yacht and rocking the nautical look all the time. That is one beautiful skirt!! Love the look, especially the gorgeous peacock necklace! I'll have to check that one out.